The grey geese are back, grazing the parks that run down to the shore. From now until mid April, when they head North, they'll be gorging on spring grass. Its not as bad here as on Islay where tens of thousands of geese overwinter on the RSPB reserves. The geese don't have the impact here that they have on Islay but its still worth scaring them away. I have just finished putting the first batch of 2013 eggs into the incubator. Its a tricky business simulating a mother hen but this machine has automatic turning and temperature control; the eggs are turned every 45 mins and the temperature is kept at a steady 37.5C. Good humidity control is just as important as temperature and turning. In the broad rounded end of the egg there is an air sac and during incubation this expands to provide an air supply for the embryo in the hours before it chips its way out of the shell. Ideally the egg has to lose 13% of its weight over the first 18 days of incubation. Moisture passes out through the shell pores and is replaced with air. The eggs are weighed regularly to check; if weight loss is too low humidity is reduced and vice versa. In order to monitor weight loss I plot the ideal on a graph (red line) then at seven days and 14 days I weigh the eggs again. The 42 eggs set averaged 65g today and by day 18 they should weigh 56.7g. Next Thursday (day 7) I will candle the eggs to see how many contain developing embryos and they will be weighed then. Hatching should happen after 21 days on the 14th March. I have had three Ixworth cockerels running together with three pullets since they were hatched last summer. They co-existed peacefully until today. After breakfast I found one dead and another lying on his back with his feet in the air totally exhausted. There had been a fight to the death. A bit like sheep, big heavy cockerels have difficulty getting on their feet when "coupit". St. Valentine's Day is supposed to be when the birds get together at the start of the breeding season. The poultry must have got the same message and that is what started the fight. The dead cockerel was still twitching when I got there so he is now marinading in red wine with a view to becoming Coq au Vin tomorrow. In the morning together with; celery, carrots, onions, garlic, bay leaf and thyme I'll boil it and reduce the wine to about half its volume. The meat will then floured and browned mixed with previously cooked lardons then mushrooms and a dash of cognac will be added and it'll all be cooked very slowly in the bottom of the Rayburn oven. Hatching eggs dead or alive? I have just received a bizarre letter from Royal Mail. Like hundreds of other hatching egg producers I send eggs to customers by Special Delivery. Last month a parcel went astray and arrived with the buyer a week late so I said I would apply for compensation. I paid £7.55 for it to be delivered the next day before 1.00pm. 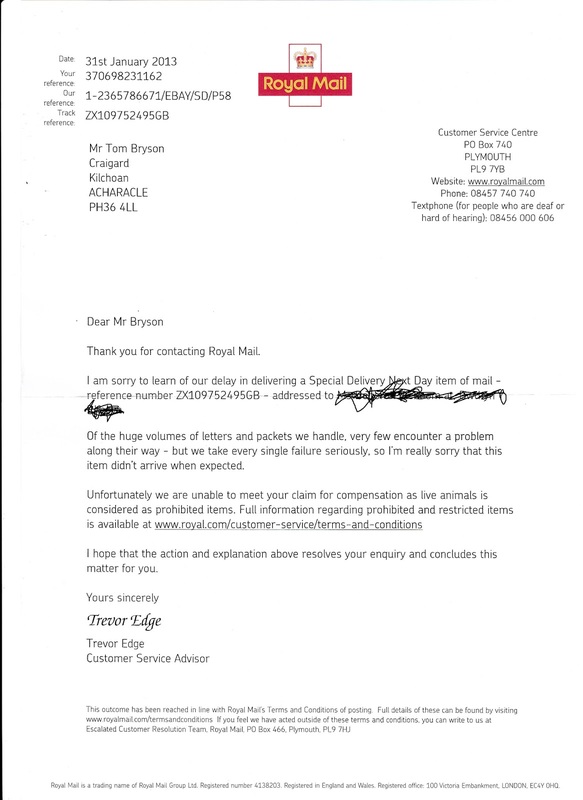 The Royal Mail letter explains that hatching eggs are considered to be "live animals" and therefore prohibited items not eligible for compensation if not delivered on time. 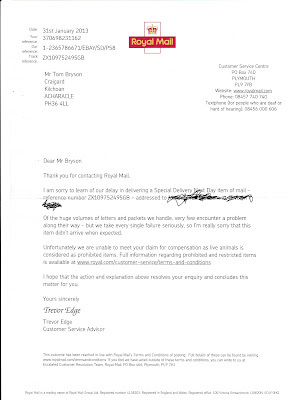 In a polite exchange with a person at their Customer Service centre I was told that , "if the eggs were for eating then compensation would be paid but as these are deemed live animals no compensation would be paid". Is a hatching egg alive or dead? The embryo is in a state of suspended animation until it is put in an incubator or under a hen so it must be alive. However a fertile egg sent by Special Delivery destined for scrambling, boiling or poaching is deemed "dead" by the Royal mail. Another corporate wheeze to avoid paying compensation for poor service?